Schneider Electric offers long-term protection for your automation investment by simplifying your adoption, upgrade and migration to Modicon PLCs. We do this by offering conversion kits that allow you to replace legacy products without requiring expensive rewiring or cabling and streamline connectivity to other automation products even those from other vendors. To further minimise your risk, dedicated service teams specialised in bridging the gap between old and new technologies are available to manage the whole process. Starting with a comprehensive analysis of your current systems, we identify ways to improve performance by incrementally updating your systems to replace outdated equipment in phases. This enables you to immediately benefit from modern equipment, quickly recover the cost of upgrading and have a positive impact on your bottom line for years to come. The Modicon M171 optimized logic controller for simple and compact machines is the smallest programmable controller on the market. The Modicon M171 optimized unit can also be flush mounted and requires minimal installation effort, while offering tremendous versatility. 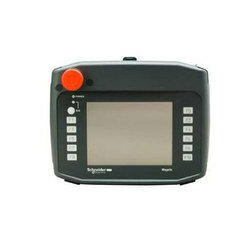 The Modicon M171 performance logic controller for complex and BMS-connectable machines. This controller provides more powerful memory, I/Os, connectivity and an embedded webserver. The Modicon M172 performance logic controller for large and connected machines. For more performance, connectivity and scalabity. The Schneider Modicon M258 PLC Logic Controller is a controller with a variety of powerful features. It can control a wide range of applications. 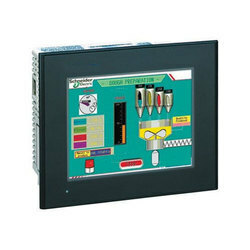 Schneider Magelis I Display Industrial Display SCADA System screens are monitors with industrial flat screens designed for use in conjunction with PCs. Two screen sizes are available: 15" and 19" to suit various types of requirements. Featuring the latest TFT LCD technology, they offer top class viewing and extended service life. Their touch screen interface enables easy creation of user-friendly and high performance HMI interfaces. The Magelis iDisplay screen MPCNB50NAN00N also has a 70-key (standard IBM) keypad and user function keys (2 x 20 keys). Certified in accordance with PLC product standards, designed for use in severe industrial environments and offering an excellent screen size/dimensions ratio, they can be installed easily on any machine and in any equipment. They are suitable for use in any type of environment. 15" Magelis iDisplay screens have the same cut-out dimensions as 15" Magelis Panel PCs, which makes it easy to upgrade installations. LED backlight for the whole range enabling energy saving. Complete dimming functionality available for specific applications like Marine, or to reduce power consumption. Availability of a 7" wide display offering up to 40% more graphic space than standard 5"7 for equivalent price. Embedded Ethernet for all terminals with wide choice of web services (Webgate, Ftp server, Diag server) and 2 Serial lines for communications with devices on the machines. Up-to-date interfaces ( USB 2.0 , SD cards ) to allow easy maintenance and good peripheral links. The 4 Gb SD card allows large log files capability, and the new mini-USB port allows downloads with standard cable. Same cut-out than Magelis XBTGT range, for an easy substitution by keeping the same design of your machine. Minimum way for connectors location to offer a better cabling of the panels. Unique fast connection power plug for the whole range. Only 4 installation fasteners for the whole range. Addition of function keys on 3"5 and 7" wide displays with good click feeling to allow space saving in visualization and simultaneous actions on buttons for Safety. Magelis GTO operating now up to 55 ??? for hot environment. Worldwide certifications including hazardous locations (ISA 1212, ATEX 3 certificates) and Marine "Bridge and Deck" to allow installation in these specifics applications. Smart environmental covers accessory to protects against chemical and oil substances in machine tools environment. Stainless steel panels and conformal coating for applications in Food & Beverage or Pharmaceutical industry. High definition colour screen TFT QVGA 3.5' and 5.7"
The Schneider Modicon M238 PLC Logic Controller has a variety of powerful features. 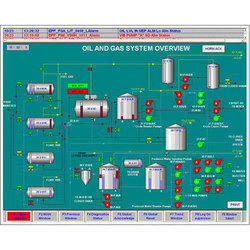 This controller can service a wide range of applications. Achieve benchmark performance while increasing profitability with the Modicon M221 Logic Controller (PLC). Available in both standard and book formats, the Modicon M221 PLC offers best-in-class performance while requiring minimal installation and offering instant access to maintenance and machine visualization. The M221 programs with SoMachine Basic which can be downloaded free of charge. It's also included with the full version of SoMachine software. 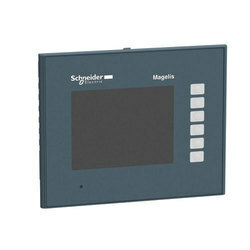 The Schneider Modicon M251 Logic Controller CANopen or Modbus TCP let you easily connect to SCADA, MES, ERP by standard Ethernet cables and even via Wi-Fi. Boost your machine’s performance with data transfer via SD Card, embedded web server and more. Get unlimited access to your machine via Ethernet - everywhere and any time and simplify maintenance with any mobile device through visualization pages designed directly inside SoMachine and stored in the PLC’s web server. Extremely powerful, rugged and compact, the Modicon M340 PLC provides cutting-edge features and high-end performance in a mid-range processor. The Modicon M340 high-performance processor benefits from all the latest techniques and technologies and is equally at home with boolean processing as with fixed or floating decimal calculations. With an internal memory of 4 MB, Modicon M340 is designed to manage applications up to 70Kinstructions, and 256KB data. Your application is backed up on SD Card and your data in the internal Flash memory. No battery is required, so you avoid the associated maintenance.Your data is automatically backed up in the internal Flash memory and your application in an SD Card. No battery is required, so you avoid the associated maintenance. The "Plug & Load" technology of the card enables easy updating of your application or transfer to other machines with no disruption of operation. You can also store data files (recipes, traceability) or maintenance files, easily accessed from a PC or by simple "drag-and-drop" via FTP. Communicating, Modicon M340 assures programming of your applications via USB port or Ethernet. Wherever you are, you can access your machines in complete security via modem or standard ADSL serial link. Depending on the technology chosen, you can programme online, transfer your programmes, access data files and thanks to the embedded Web server, manage remote operation and diagnostics. Schneider Modicon MC80 PLC is an automated platform processor which manages the entire PLC station made up of discrete I/O functions, analog input functions, counting functions, and communication functions. The MC80 PLCs are available in 5 different variants, they are BMK C80 20310, BMK C80 30310, BMK C80 20300, BMK C80 20301 and BMK C80 30311. 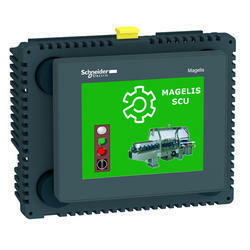 The ultra-compact range of Magelis SCU Small HMI controllers are part of Schneider Magelis SCU Small HMI Controllers concept, a key element in Machine Struxure .The Magelis SCU HMI controllers offer brings together Human Machine Interface and control functions within in a single product . This reduces the amount of equipment required and the associated costs throughout the life cycle of the machine . 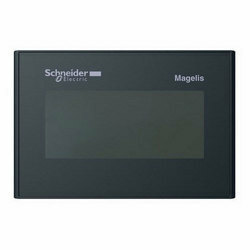 The Magelis SCU Small HMI controllers integrate, as standard, all their functions . They benefit, in particular, from the same innovation as the Magelis STU Small panels range: Mounting via a 22 mm diameter hole (pushbutton type) which considerably simplifies installation. Range of 16 touch screen terminals (XBT GT) available with a wide choice of screen sizes (3.8", 5.7", 7.5", 10.4" 12.1" and 15") in various versions (monochrome, color, STN or TFT). Range of 3 keypad/touch screen terminals (XBT GK), sizes 5.7" and 10.4" (monochrome, color). This range is made up of the complete Magelis XBTGT or Magelis XBTGK Standard Advanced panels offers combined with a Control part using the XBTZG CANM CANopen module. During operation, this module controls the I/O and the peripherals distributed via the CANopen bus. This combination also offers numerous advanced functions such as video, data management (sharing of data, log), etc. The Schneider Modicon M241 Logic Controller offers best-in-class communication with 5 embedded ports. It offers you state of the art technical features and embedded CANopen for fieldbus architectures up to 63 devices while reducing your installation time and cost. Get unlimited access to your machine via Ethernet - everywhere and any time and simplify maintenance with any mobile device through visualization pages designed directly inside SoMachine and stored in the PLC’s web server.
. 10", 12" and 15"
. Streaming Video, Webcam management and sound from an integrated output.
. View all Web pages locally or remotely for easy diagnostics and maintenance.
. Dual Ethernet, compact flash card slot, 4 USB ports, PCMCIA slots on the 15", access all the PC world peripherals: USB storage units (memory key, external hard disc, DVD player/burner, etc. ), USB user interface (keyboard, mouse, etc. ),PCMCIA communication card (wireless network, etc.).
. High definition display of sensitive colourful touch screen.
. Wide viewing angle up to 160Â°, optimum contrast and brightness.
. USB port on front panel. Simplified upgrading thanks to dimensions identical to Magelis XBT GT. If the Magelis XBT GTW terminal is already familiar to you, it's because it uses a Windows environment and allows you to navigate freely on the Web. Associated with Vijeo Designer configuration software, you multiply its potential and benefit from true multimedia functions.
. Infrastructure & automation in Building. To optimise your machines, a direct link between Zelio logic and MBenefitsagelis XBTN ensures you benefit from all the HMI functions. Display text messages, or semi-graphic screen, perform diagnostics, control and adjust your control system devices... the Magelis XBT N, R, RT brings you greater convenience and ease of use, with a substantially reduced size. With the new Magelis XBT RT, you benefit from a touch screen and semi-graphic display. Simple and compact machine builders. The XBT N/R/RT terminal polls the missing equipment (usually a PLC) every 5 seconds. All the configured PLCs in an application should be connected. A missing equipment is therefore considered to be a temporary problem, i.e. the PLC or XBT is temporarily disconnected, and communication will resume as soon as the connection is re-established. In this arrangement, degraded communication performance is considered acceptable. Optimum (Panel PC) with fanless Intel Atom Z CPU. Performance: up to 5 PCI/PCIE slots, and Intel Core 2 Duo 2.26Ghz or i3 CPU without fan. The monolithic USB tower lights of the Harmony XVGU - USB Tower Light range are designed to support HMI (Magelis product range (1)). These new tower lights with multi-color LEDs are unique and simple-to-use as the states and patterns are directly set and modifi ed in the HMI application. The XVGU tower lights provide long distance indication of the operating status or sequences of a machine or installation, both visually by means of illuminatedsignalling units with 360° visibility, and audibly by means of a buzzer. The tower light comes with a pre-assembled USB cable for simple wiring and easy integration with the Magelis product range(1) (2). 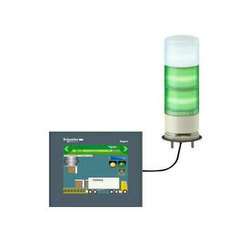 The tower light settings are set in the Set screen of the HMI application at the time of integration. The multi-color LEDs on all the three levels can be set to any color combinations (red, orange, green or blue) for sophisticated signalling. The 2-tone buzzer patterns and levels can be adjusted easily. The tower lights are easy to order as many customized confi gurations can be made from a single part number. The range involves Ø 60 mm products and is therefore ideal for use in many activity sectors, including metal tools, plastic extrusion machines, SMT, textiles, packaging, baggage handling and assembly lines. This range is only for indoor applications. Your Magelis advanced panel is configurable by Vijeo Designer and is equiped with an USB port, Harmony XVGU is made for you Harmony XVGU is an innovative monolithic tower light with USB cable connection, easy to configure, easy to install, and with an unique design. User configuration is done on location through Vijeo Designer on Magelisâ„¢ HMI devices which also intelligently manage all power and signalling. No wiring is required between the tower light and the HMI advanced panels. Harmony XVGU comes with a pre-assembled USB cable that is very simple to connect directly to the HMI. Two mounting techniques are available â€“ 100mm pole mounting, or direct mounting, both methods require fixing plate which is delivered with the tower light. Packaging Details: XVGU tower lights are supplied: with 3 multi-color LEDs and a clear lens, with a 2-tone buzzer, with pre-assembled USB cable for easy connection (2), with USB cable clamp to ensure fi rm connection,bfi tted with one of the following mounting options: direct base mounting (IP 42), aluminium tube mounting and fi xing plate (IP 42). Schneider SCADA Systems allow you to monitor and control field operations across a widely dispersed infrastructure. From simple reservoir level measurement to well pad optimisation integrated with ERP, these systems are constantly challenged by emerging regulations, rapid technology change and industrial trends. Schneider Electric helps you face remote operation challenges with integrated, secure and reliable end-to-end Telemetry and Remote SCADA Solutions. Leveraging a proven track record in a wide range of industries and expertise in the areas of instrumentation, control and data acquisition, wireless communication and IT, Schneider Electric, Telemetry and Remote SCADA Solutions can help make the most of your remote operations and assets.